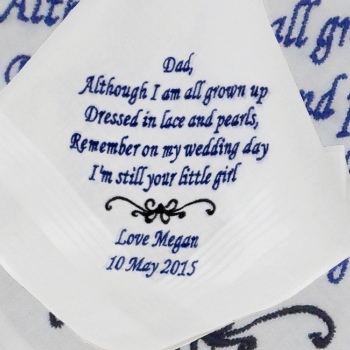 Father of the Bride wedding handkerchief with this special poem embroidered. Father of the Bride wedding handkerchief with this special poem embroidered. A traditional gift for the Father of the bride on the big day. Embroidered on a standard mens classic cotton handkerchief or you can choose to upgrade to a mens pure Irish Linen handkerchief.